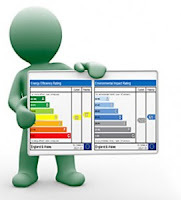 Energy Efficiency Certificate in Spain: What is an EEC? Who can issue an EEC? What is involved to get an EEC? How much does an EEC cost? AN ENERGY Efficiency Certificate, or Certificado de Eficiencia Energética, also referred to as an Energy Performance Certificate (EPC), is a legal document that contains information about the energy characteristics and energy efficiency of a dwelling or building according to the calculation method defined by the Ministry of Industry, Energy and Tourism. The certificate provides a rating of the energy efficiency and the carbon monoxide emissions using an A to G scale. It measures the energy efficiency by taking into account the energy consumption that it is considered necessary to meet the energy demand of the building under normal operating conditions and occupation, including the energy used in heating, refrigeration, ventilation, lighting and the production of hot water. It also includes recommendations on ways to improve the buildings energy efficiency in order to improve the energy class and save money. On 1st June 2013 it became compulsory for property owners to obtain an EEC in order to sell or rent a property (conditions apply). The certificate is valid for 10 years. What does an EEC cost?